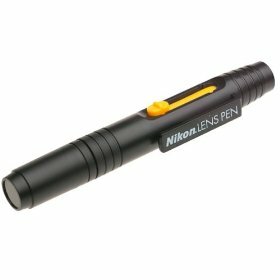 The Nikon Lens Pen Cleaning Pen System is a great accessory for any optics user, making it great for maintaining your digital or film camera, binoculars, telescopes, or spotting scopes. The soft retractable brush combined with a non-liquid compound on a natural chamois tip removes fingerprints, dust and other debris that may compromise your lens. The small, pen-style design easily fits in any camera bag, as the soft brush retracts into pen body to stay clean.